Renewable energy is already cheaper than other energy options in most of the world, but it comes with other economic and societal benefits as well. Because of the number of countries investing in renewable energy, the complexity of their national economies and their energy infrastructure details, it isn’t possible to cover everything in one online article. The subject would be better addressed in a book. So, this article is intended only to be a snapshot of some key high-level points. Click here to continue reading. This is the fifth year for GRID Alternatives’ Solar Spring Break program, which provides college students the opportunity to install solar projects in underserved communities across the country. Under the state’s program operational community solar capacity in Xcel’s Service area has grown more than four-fold over the last 12 months, with another 381 MW in design or construction. 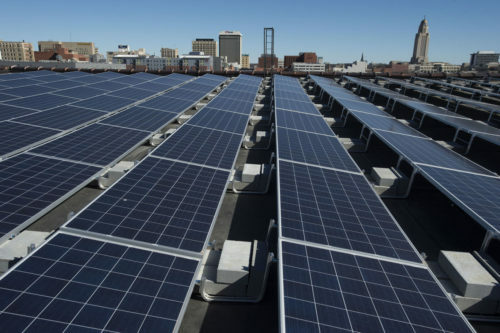 The utility has reached 970 MW of installed solar power capacity. With four new projects totaling 649 MW, this which will bring Georgia Power to 1,619 MW by the end of 2019. This entry was posted in Nebraska / Midwest News, NewsBlog and tagged benefits of renewable energy, guides for homeowners in valuing their solar systems, Nebraskans for Solar's NewsBlog, solar for low-income homeowners, U.S. renewable energy news on March 14, 2018 by Helen Deffenbacher. “The overwhelming majority of employers are having difficulty hiring, and then a majority of those are saying it’s costing them—costing them money, costing them jobs. 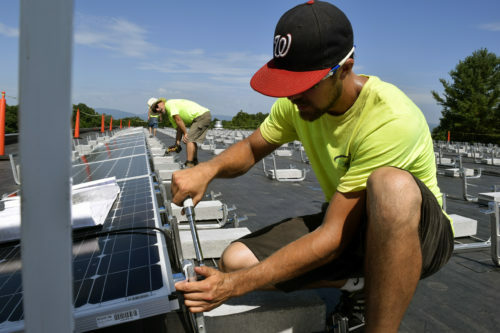 They’re turning down jobs because they just can’t find qualified workers,” said Tim Olson, who wrote The Solar Foundation’s 2017 Solar Training and Jobs Report, a report funded by a grant from the U.S. Department of Energy’s SunShot Initiative. “Difficult hiring isn’t just unique to the solar industry,” Olson said. “You look at a lot of other skilled labor and general manufacturing positions in the U.S. and there is relatively high difficulty hiring right now—the unemployment rate is hitting all-time lows.” Click here to read more. Photo: Mountain View Solar in Maryland collaborates with a local community college on a summer internship program. Oil Giants See a Future in Offshore Wind Power. Their Suppliers Are Investing, Too, Inside Climate News. Analysts forecast a sixfold increase in offshore wind power capacity by 2030, but while Europe’s market booms, U.S. growth has been slow. That may be changing. This entry was posted in NewsBlog and tagged benefits of renewable energy, energy storage, Nebraskans for Solar, renewable energy news, solar energy jobs on January 12, 2018 by Helen Deffenbacher.